Today's best online shopping deals. Constantly updated. Always awesome. 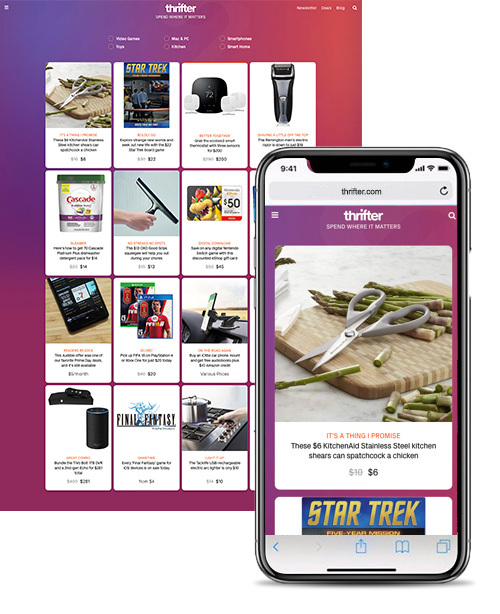 Lead by a team of experienced and passionate deal hunters supported by propriety deal-finding tech, Thrifter is a next-generation shopping platform for smart consumers. Beyond tech, Thrifter covers categories including home, office, toys, health, travel and more. We believe being a Thrifter isn't about being dirt cheap and never spending money on things you want - it's about making sure when you do spend money that your hard-earned dollars are stretching as far they can. Thrifter empowers users by imparting money-saving knowledge and advice, unlocking the confidence that comes with financial stability. Thrifter guides users along a path to an awesome life, finding that happy balance between saving and occasionally splurging. After all, being smart with your money should be celebrated! We've all heard the old wealth creation adage, It's not how much you earn that matters, but how much you spend. This still rings true today, and Thrifter is here to help. The Thrifter Deals Team shares advice, tips and recommendations to help you make smarter purchase decisions each and every day. It's all about making sure you spend where it matters most. Join the Thrifter revolution and stretch your hard-earned dollar like never before. Your savings account will thank you.